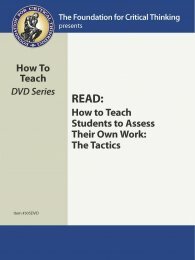 305DVD How to Teach Students to Assess Their Own Work: The Tactics (Read DVD) $14.95	 Qty. Everyone thinks, but to think well we must learn to think explicitly about how we are thinking and make corrective adjustments as a result. For example, many students “study” but few think analytically about how they study and then reshape their study habits. This tape focuses on teaching for excellence in self-assessment, including specific teaching strategies.